Choosing the right high chair is up there with picking out the best stroller and bassinet for your baby. But not everyone has the most spacious kitchen and at one point, you might find yourself asking, what are the best high chairs for small spaces? The short answer is that there are plenty to choose from for almost any situation. So many, in fact, that it might be hard to choose between them. But these are easily some of the best high chairs for smaller spaces that you will find. If you prefer to start off with a high chair that connects to your kitchen chairs instead of stand on its own, there are a few to choose from. On the other hand, there are also several stand-alone high chairs that fold up with ease or even fold down to a more compact size for storing away when it’s not in use. You might also go with a high chair that attaches to the side of your kitchen or dining table since in those cases, you can also take the little high chair on the go and use it almost anywhere. Choosing the right high chair doesn’t have to be the hardest decision you will make as a parent and with all of these to choose from, it just became a little easier for you. The Fisher-Price SpaceSaver High Chair isn’t your standard standalone high chair, but it does offer everything a regular one does and more. In fact, your little one can get literal years of use out of the space saving high chair thanks to its versatile design. To use it, you simply strap it securely to a dining chair and your baby can begin eating with the family by using the connected tray. Or, you can pull the chair right up to the table and since the high chair will already be at table height, there’s no tricky adjusting. The high chair does, however, have two height adjustments and three recline positions if needed and it can transition to an easy to use a booster seat when your little one is ready. Plus, the chair cover is completely machine washable and has a safe five-point harness. Child Weight Range: The high chair is designed for little ones up to 40 pounds. Where To Buy: You can purchase it on Amazon or in-store at Target and Buy Buy Baby. The Best Part: You can snap the tray to the back of the chair to store it when it’s not in use. The Not So Great: It can sometimes be difficult to get the tray to secure onto the high chair. Price: On Amazon, the Fisher-Price SpaceSaver High Chair is $40. The Cosco Simple Fold High Chair might look like a standard run of the mill high chair, but the beauty is in the name. Because not only will it fit in most kitchens and dining areas with ease, but when it’s not in use, you can fold it flat enough to slide it in almost any closet. Plus, when it’s folded, the high chair can stand on its own, which is another added bonus. The three-point harness will keep your little one secure while still giving him or her some wiggle room while they eat and the seat can be wiped clean so you won’t have to worry about throwing it in the washer every time your baby makes a mess. And let’s face it — your baby will definitely make a few dozen messes every week. And unlike some other high chairs for small spaces, this one comes with a convenient and comfortable footrest for your little one so their feet aren’t dangling down. Child Weight Range: It can be used for children up to 50 pounds. Where To Buy: You can purchase it on Amazon or in store at Target. The Best Part: It’s easy to fold it when it’s not in use and slide it out of place and out of sight. The Not So Great: Although you can wipe down the seat cover, it does not come off for a deeper cleaning. Price: On Amazon, the Cosco Simple Fold High Chair is $40. Besides just looking sleek and modern, the Joovy Nook High Chair has all of the basic essentials for your baby when it comes to having a safe and comfortable place to eat. The seat cushion itself is ultra padded to keep your little one comfortable as they grow and it can either be wiped clean or thrown in the washer to give it a deep clean whenever needed. The attached tray swings open with just one hand, which can make it a lot easier to use and operate than your standard removable trays that typically come on high chairs. You can also wipe down the tray and put the tray insert in the dishwasher with the rest of your dishes, so it’s not a headache to get it squeaky clean for your baby’s next meal. You can also collapse the high chair down flat, but the difference here is that it is so flat, you can pick it up by a handle and store it away anywhere, from in a cramped closet to under the sofa. It folds up that small and compact. It also comes in a variety of seat pad covers so you can choose which option goes best with your home. Child Weight Range: It’s made for children up to 50 pounds. The Best Part: Unlike most other high chairs, it folds flat, but compact too. The Not So Great: Some parents might not like that the high chair has no seat recline options. Price: On Amazon, theJoovy Nook High Chair is $100. The Primo Cozy Tot Deluxe Convertible Folding High Chair is another one that just looks nice no matter what home it’s in. That may not be the main selling point for some parents, but it is always a nice bonus to have a sleek looking high chair that isn’t bulky and doesn’t take up any unnecessary space in your home. Not only that, but the Primo Cozy Tot also converts to a toddler chair when needed, but you can switch back and forth between modes with a few easy steps. When the high hair isn’t in use, it folds flat for easy storage, but when it’s being used for meals, it doesn’t take up a ton of room. There’s no seat pad to worry about cleaning or dealing with a mold or mildew buildup and the double feeding tray is dishwasher safe. Plus, there are multiple settings on the tray to get it at just the right position for your growing toddler. Child Weight Range: The high chair is for children up to 30 pounds. The Best Part: When properly folded down, the high chair is only 10 inches wide. The Not So Great: Because there is no seat cushion, the high chair might not be as comfortable as other options out there. Price: On Amazon, the Primo Cozy Tot Deluxe Convertible Folding High Chair is $100. 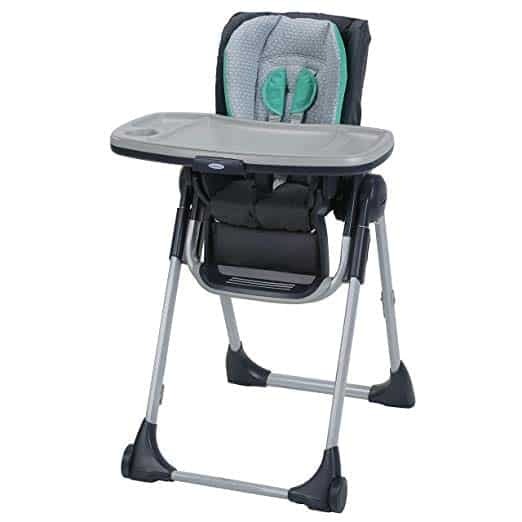 The Graco Slim Snacker High Chair has almost everything your baby needs, from a comfortable seat pad to a footrest and a little storage basket underneath. But it also has a one-handed one-second fold to close up the high chair when it’s not in use. Then, you can easily slide it in a closet or in the pantry between uses. The seat pad is wipeable in the event of those awful dinnertime messes your baby is bound to make. And during meals, you can keep your little one’s essentials in the little storage backset underneath. Plus, once you fold it, the high chair stands on its own. It also has a three and five-point harness to keep your baby safe and secure and there are three different recline positions for your little one’s optimum comfort. There’s even a full-sized cup holder built into the tray, so the high chair has thought of nearly everything. Child Weight Range: The high chair is made for children up to 40 pounds. Where To Buy: You can find it on the manufacturer’s website and on Amazon or in-store at Walmart and Buy Buy Baby. The Best Part: It reclines for your baby’s safety and comfort. The Not So Great: Although there are three and five-point harnesses on the high chair, your baby might still be able to squirm around in the seat. Price: On Amazon, the Graco Slim Snacker High Chair is $58. Has This Item Been Recalled? : There are no recent or current recalls on this Graco high chair. The Mountain Buggy Pod Clip-On High Chair is a more unique alternative to the standard high chair you might be used to. It clamps to the end of most tables to give your little one a comfortable spot at the dinner table no matter where you are. And when you want to take it on the go with you, you can fold the high chair flat for easy transport. It also takes up the least room possible when attached to your dining room or kitchen table, which is more than can be said for most regular high chairs. It’s comfortable and durable for most growing babies, with a carry bag that makes it easy to bring the high chair with you anywhere you go. You can even place the carrying back in the basket of your stroller. That’s how compact and versatile it is. The high chair also has a strong aluminum frame and shoulder harness system to keep your baby secure. Child Weight Range: The high chair can be used for little ones up to 37 pounds. The Best Part: It weighs less than three pounds and is totally portable. The Not So Great: You can’t use the high chair for glass top tables, which can be disappointing for families with glass dining tables. Price: On Amazon, the Mountain Buggy Pod Clip-On High Chair is $60. The Chicco 360 Hook-On Chair is another clamp-on portable high chair seat that can be attached to most dining tables. The difference with this seat, however, is that the seat itself swivels around all the way so they can face forward at the table or face you next to them while you feed them. It really leaves the possibilities almost endless. The seat does lock in six different positions though so your little one isn’t left moving around. It also has a safety clip and hand washable fabric seat pad. Plus, you can put the tray in the dishwasher to get it clean and sanitized every time. You can use it at the table with or without the attached tray, but either way, your baby is sure to be comfortable and have fun having their meals with the rest of the family. You can even take it with you on the go and clamp it to the side of tables in most restaurants. Child Weight Range: The high chair is designed for babies up to 37 pounds. Where To Buy: You can purchase it on the manufacturer’s website and on Amazon or in-store at Buy Buy Baby. The Best Part: The seat is genuinely comfortable for most babies. The Not So Great: There are little creases where crumbs can get stuck in, making the high chair a little harder to clean. Price: On Amazon, the Chicco 360 Hook-On Chair is $75. Another Graco option, the Graco Swift Fold LX High Chair is also an easy to fold slim high chair that is perfect for smaller kitchens and dining spaces. You can fold it with just one hand and in one motion, so it’s fairly easy to fold up the high chair and store it away between uses. The seat cover has a lot of cushions to keep your little one comfortable and even little pads on the shoulder straps, which work to keep your baby safe during meals. There are nine different height adjustments to choose from to get your baby at the right height, depending on your dining room or kitchen table. You can either use it with the attached tray or pull the high chair right up to the table as your baby gets older. Either way, the high chair offers a comfortable and safe place for your little one to have meals with the family. Child Weight Range: The high chair is for babies up to 40 pounds. The Best Part: There are a lot of different heights to choose from. The Not So Great: It is a little pricey, especially when compared to other high chairs for small spaces. Price: On Amazon, the Graco Swift Fold LX High Chair is $128. No matter your preference for the right high chair for your family, there is something for everyone. Luckily, all of these high chairs for smaller spaces also vary in price, so you won’t have to pay an arm and a leg if you really can’t afford it. And let’s face it — when you have a million other baby products to buy, finding a cost-effective high chair is pretty great. The best part is, you won’t be sacrificing quality for affordability. If you need a compact high chair made for smaller spaces, one of these is bound to work for you.